Tripwire Interactive’s Rising Storm 2: Vietnam, a computer game released on Steam in May 2017, fits somewhere in the middle of the realism scale for a first-person war shooter. On one end are the “arcade” shooters such as Call of Duty and Battlefield. On the other end are the open-world simulators of the ARMA series and their military training sibling Virtual Battlespace. Like the less-complex titles, Rising Storm 2 is a series of bloody set-piece multiplayer battles set during the Vietnam War with time limits and minimal consequences to being “killed.” Upon one’s virtual death, in a few seconds, you respawn and run back into the action. But like the more realistic games, proper tactics are important and the various Cold War-era weapons handle pretty much like the real ones. An SKS carbine functions more or less like an SKS does in real life, and when reloading, the game takes an almost loving approach to the animation. Your first indication of the enemy might be the sound of a bullet snapping overhead, seeing a muzzle flash from the window of a bamboo hut, or the screen going black from being shot from a hidden muzzle in a bush. Fire and movement, smoke screens, cover and suppression fire are all essential tactics. Grabbing an AK-47, hopping around a streetcorner in urban Hue and firing off an entire 30-round magazine is usually unwise, but there are times and places when it’s advisable to go fully-automatic. I’ve played all of Tripwire’s games. Red Orchestra: Ostfront 41-45 and its 2011 sequel Red Orchestra 2: Heroes of Stalingrad both depict the Eastern Front in World War II, and the third title, Rising Storm, moved the setting to the Pacific. They’re casual games and not simulations, but the weapons are realistic enough that they add an element of tactical depth that most first-person shooters lack. To the developers’ credit, Rising Storm 2 depicts a conflict that doesn’t get much attention in the shooter world. I think part of the blame for this lies with the cultural influence of Hollywood, which has shied away from Vietnam movies since the 1980s. But there’s also the mechanical challenges in creating fair and balanced gameplay in a setting in which the U.S. military possessed an overwhelming technological advantage. Tripwire came up with an interesting solution. To be sure, the American side in the game is better-armed than the Vietnamese, and the player designated as the commander can rain down artillery, napalm and an orbiting AC-47 Spooky gunship. Depending on the scenario, the player can pilot a minigun-equipped OH-6 Cayuse or rocket-armed AH-1 Cobra attack helicopter. It’s a ridiculous amount of firepower. Given that the game models bullet penetration of structures, an American player equipped with a belt-fed M60 machine gun will best serve the team by simply spraying hundreds of bullets in the general direction of the enemy. A tin shack provides concealment, but not cover—so blast away. Then get a friend to lob a high-explosive grenade at it from an M79 launcher. The Vietnamese play a little differently. They have mines, pop-up punji sticks and tripwire bombs which can—if used en masse—deny an area of the map to the American forces. The game automatically sorts players into squads, and the Vietnamese squad leaders can build “tunnel” entrances, allowing their squadmates to spawn on the point—a nod to the Viet Cong’s underground networks. While the Americans have more raw destructive power, the Vietnamese side can get back into the action faster, outnumbering the Americans and keeping up the pressure. In the “Supremacy” game mode, which determines victory by holding more points across the map, strategically-placed tunnel can function as the locus of an insurgency, meaning the Vietnamese can contest more points simultaneously. It might also just be my eyes, but when playing I found the Viet Cong’s characteristic black clothing to be harder to spot, as they blend into shadows and the jungle. In combination, these tricks are enough to disrupt—and demoralize—an American team, resulting in a communist victory. But it’s not a guarantee. 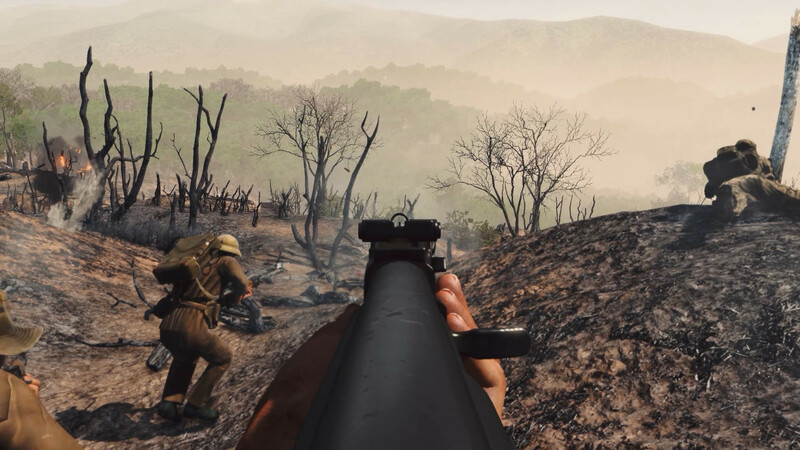 What can Rising Storm 2: Vietnam teach us about the Vietnam War? Frankly, not too much, as this is a casual game designed for gamers, not soldiers. But through its creative balancing act, the game stays true enough to the reality of the U.S. military’s technological edge, and the fact that Vietnam’s communist forces were a formidable adversary.